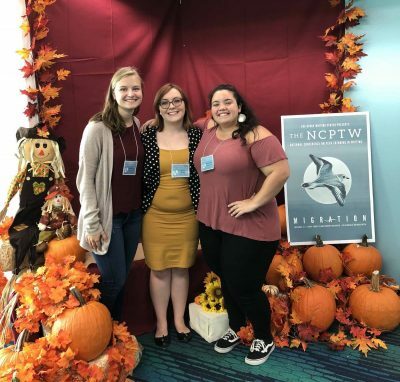 Three peer tutors, Jeanette Jakupca, Aiyanna Maciel, and Amber Biron, along with their director, Leigh Ann Dunning, from Stetson University’s Writing Center, traveled to South Padre Island, Texas, during the first weekend of November to present their research at the National Conference on Peer Tutoring in Writing (NCPTW). From left, Amber Biron, Jeanette Jakupca and Aiyanna Maciel take time out from the conference. The theme of this year’s conference, which was hosted by the University of Texas Rio Grande Valley, was Migration. During the conference, attendees considered the variety of borders that exist in and around writing centers as well as ways to move through these borders. In line with the conference theme, seniors Jakupca, Maciel, and Biron presented their qualitative research project in a panel presentation, “Becoming a Multilingual Writing Center: Connecting the International Student’s Perspective of the Writing Center to Best Practices for Tutors.” Their research involved interviewing international and multilingual undergraduate students at Stetson to understand this demographic’s perceptions of the Writing Center, so that the Writing Center can implement programing or tutoring strategies that better fit their needs and expectations. 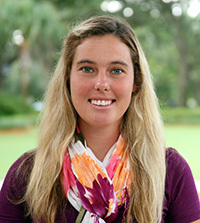 “We were able to workshop new ways of helping them [international and multilingual students] and new ways to market to promote visibility for this population,” Maciel, a World Languages and Cultures major, Latin American Studies minor, and Communications Manager of Stetson’s Writing Center, said of their research. Their presentation was followed by a discussion with the audience members. As a result of their research, the tutors hope to help multilingual students reflect on and utilize their experiences learning languages as a way to better understand writing for U.S. academia. In order to encourage multilingual students to visit the Writing Center, the tutors plan on creating flyers about the Writing Center’s location, hours and services that will be translated into the top spoken languages at Stetson. If you are interested in becoming a tutor or writing fellow or would like to learn more about the Writing Center, please contact Leigh Ann Dunning at ldunning@stetson.edu.